Here's your quick-start guide to fantasy world-building, with questions to help you create a rich, believable fantasy world. You can use these questions as prompts to help you get writing, or you can use the questions as a template for each world-building writing session you enter into. I've even included a bonus worksheet and checklist for you to use over and over as you make fantasy worlds come to life! We all know that characters are the life blood of any story, no matter what the genre. Here's a brief guide designed to help you find the best names for your fantasy novel's characters. Even if you have a concrete character design with a fully-fledged backstory, realistic strengths and weaknesses and you can write beautifully from their point of view, they are still going to fall short if they don’t have the right name. You know how important your characters are, and they need to be named accordingly. Names can serve many purposes in your story. 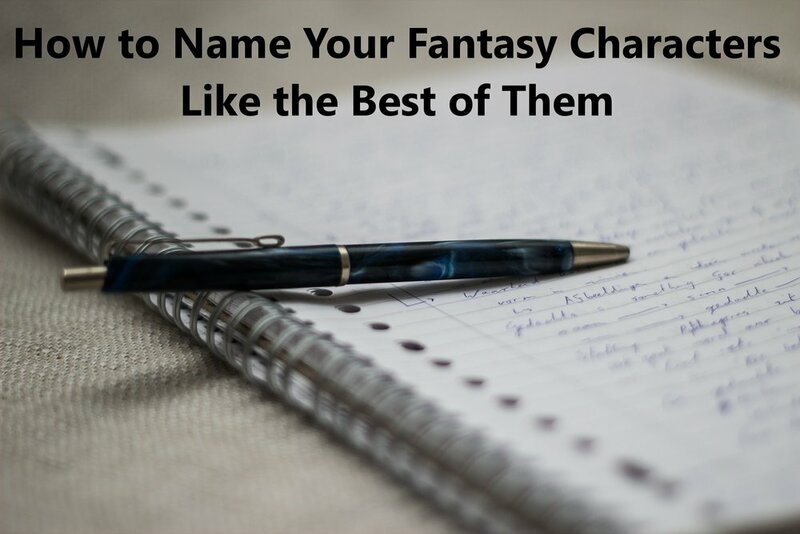 Your characters names can be used to set the theme, foreshadowing, or even irony. Take Buffy the Vampire Slayer for instance. In case you haven't seen it, it's a TV show about a teenage girl who slays vampires and deals with other forces of darkness and evil. Although “Buffy” seems like a silly name for such a dark theme, it really brings out the show’s ironic and joking element. Since it's actually a comedy show at heart, the name is very fitting. In popular teen novel Divergent, we are introduced to a character named Four. Although no initial explanation is given for this seemingly strange name, it’s later revealed that this is because this character only has 4 total fears in a society where bravery is praised and having only four fears is legendary. Be sure to take your book’s setting and time period into consideration when naming your character. Be aware of when certain names where first used and gained popularity. If your novel is set in the 1700’s, a modern name like Tiffany of Jessica would be out of place. Do research into your setting and see what some believable names are for that era. If your setting is purely fictional with no direct correlation to human civilization, you can get away with any kind of name that you want. After you’ve decided what kind of a society you want your fantasy setting to have, then you can begin to brainstorm some good names that might be given to its members. A good way to do this is to think about what is valued in this society. Is it religion? You can base many character names on the figures on your universe’s religion, just like many names in our society have biblical roots. If your fantasy setting is based on water, like an ocean or river, then more aquatic themed names can work. If they have their own language, like an alien society, then their names can literally translate to things like “deep water” or “gentle current” or “skilled fisherman”. Depending on what sort of a feel you want your society, you can choose names that give off a certain feeling. Like if you wanted to have your society to give of an unsettling vibe, use more macabre names that variations of the words dusk, skull, shadow- even regular names that just sound creepy or are associated with that theme, like "Poe". A less blunt way to do this is to look up synonyms for words like “shadow” or “black”, or even the translation of those words in other languages. Once you’ve decided on a name, say it out loud. See how it sounds. Try different pronunciations. What are all the ways a reader could pronounce it in their mind? Consider a child seeing this name. would they have trouble with it? Google search the name and see what comes up. If you’re writing a happy and uplifting story and your name search comes back with a serial killer, then maybe reconsider. It’s important to have a name that fits your character. A hardened bounty hunter rouge would need a tough and sturdy name, or at least an alias to go by if they need to be taken seriously by your readers. An affectionate or childish name like “Timmy” may not be fitting. Of course there are exceptions like Davey Crockett or Billy the Kid, etc. Just keep your character's nature in mind, and how you want the audience to view him or her. This isn’t to say that you can’t use an inaccurate name to describe a character. “Little John” from Robin for instance, was a larger character, making his name ironic, like mentioned above. Fantasy writers have a lot more freedom when it comes to naming characters than other fiction writers. While some fiction is grounded in reality and meant to take place in our human society, past present or future, fantasy doesn’t have to follow this rule at all. In a fantasy novel, all of the characters can be named after a color in a certain society, or a race of aliens can have their own unique and complex naming system of your choosing. Fantasy writers also don’t have to be restricted by time period either. Even if your story does take place when the pyramids were being built on earth, if you’re writing about a different reality than you make up your own rules for how things work in your novel. Just one of the many perks of writing fantasy. Anything is possible. While it’s true that you can get away with so much more, you still have to keep in mind how much readers are willing to believe or go along with. Everyone has their limits for suspending their disbelief, so in general just try to keep it coherent enough for people to follow along. But since you since you have this freedom, why not have fun with it? Some readers might even expect you to use outside-of-the-box names. All in all, just do what feels right for your book.